Many times you will feel difficulty in understanding and managing the processes running on your computer. Because windows task manager is not suitable for every functions. Even in the most improved version Windows 8, it is not comparable with Process explorer. It is among the most powerful system utilities for windows. 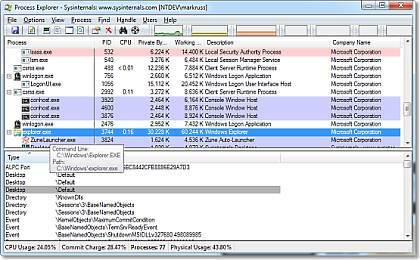 Process Explorer shows you information about which handles and DLLs processes have opened or loaded. The Process Explorer display consists of two sub-windows. The top window always shows a list of the currently active processes, including the names of their owning accounts, whereas the information displayed in the bottom window depends on the mode that Process Explorer is in: if it is in handle mode you'll see the handles that the process selected in the top window has opened; if Process Explorer is in DLL mode you'll see the DLLs and memory-mapped files that the process has loaded. Process Explorer also has a powerful search capability that will quickly show you which processes have particular handles opened or DLLs loaded. So Hurry!! 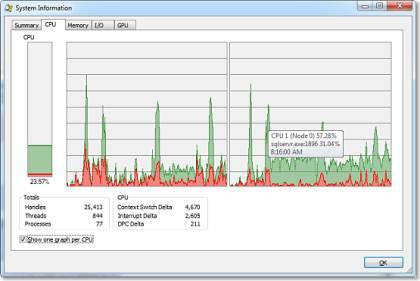 Get this powerful Process Explorer. Click here to download.